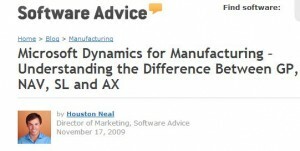 I was invited by Houston Neal, Manufacturing Software Advice, to comment on his post regarding the difference between NAV, GP, SL and AX. It was quite an interesting reading and I must say that Houston did a splendid job in describing the different Microsoft ERP packages. If you are about to choose one of the ERPs from Microsoft and are in doubt about what to choose; then take a look at his article. It gives you an overview of each of the ERPs packages broken down into Modules and which makes it easy for you to compare them.